HomeThe Artwork That Should Not BeThe Artwork That Should Not Be #10: “Speed Between The Lines” by Gamma Bomb! 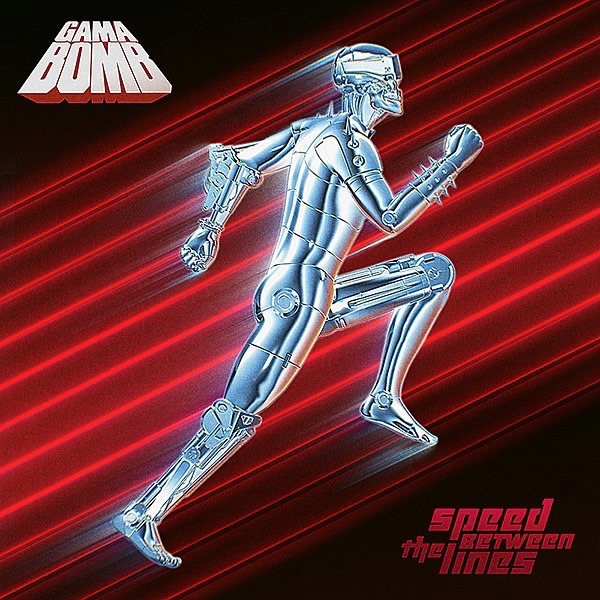 The Artwork That Should Not Be #10: “Speed Between The Lines” by Gamma Bomb! We have had a long love affair with Northern Irish Thrash Metallers Gamma Bomb. Stylistically firmly blood rooted in the 1980s and treading the fine line that is Thrash played at Punk speed with lyrics ranging from Science Fiction to Horror via the odd socially and politically aware tune, who wouldn’t want to listen to them? 2009’s “Tales From The Grave In Space” is masterful. That being said, we’re not here on a nostalgia trip. New album “Speed Between The Lines” out now via AFM Records contains all the classic elements of Gamma Bomb including that reference in the album title itself. The cover art… Did they really intend someone to rip off the concept from the film adaptation of Steven King’s “The Running Man”? The 1987 film is an Arnold Schwarzenegger classic directed by Paul Michael Glaser and deserves more credit than this abomination! A shinning robot man in a silver suit that’s so bright it will burn your retinas? Take it away!